Rainbow International Restoration of South & West Suburbs is a locally owned business based in Hickory Hills, IL that provides professional disaster restoration and cleaning services for the homes and businesses of Oak Lawn, IL and the surrounding areas. Our business was established by our current owner John Gurtler in 2007 and we quickly became a leading restoration service provider in the area. Mr. Gurtler grew up around construction work and used his experience in construction to turn Rainbow International Restoration of South & West Suburbs into a full-service restoration company that can respond to any type of disaster on commercial and residential properties. Our entire staff is committed to providing the best possible solutions in the aftermath of a disaster as well as outstanding customer service. At Rainbow International Restoration of South & West Suburbs, we provide a range of disaster restoration services that include water damage restoration, fire damage restoration, mold remediation, and content cleaning and pack-out services to restore your damaged personal items. Our technicians are IICRC certified and use superior equipment along with proven methods to completely restore your home or building to its pre-disaster state. Each member of our staff goes through an extensive background check to ensure that we send trustworthy individuals to your home to help in a time of crisis. We also have professional relationships with local insurance agents and adjusters, realtors, property managers, home inspectors, roofers, and other contractors to help make the restoration process as efficient and cost-effective as possible. We will work directly with all major insurance carriers and provide direct billing to your insurance provider to cover your claim. We also help keep your costs low with our economical pricing. Ask about our price match guarantee! Rainbow International Restoration of South & West Suburbs will meet or beat competitive proposals that are also in line with the IICRC’s standard of care. Rainbow International Restoration of South & West Suburbs has received several awards commending our dedication to our clients and the local community including the Better Business Bureau’s Prestigious Torch Award, the Annual Award for Business Excellence (AABE) from the Daily Herald, and the Excellence in Leadership Award from the Dwyer Group. We have also helped with many large local projects including helping a neighboring Rainbow International franchise after a large fire caused damage to businesses and apartments in Utica, IL. With over 100 years of combined experience, our technicians are ready to handle any type of disaster and we are available 24 hours a day to respond to emergencies. You can contact Rainbow International Restoration of South & West Suburbs by calling (708) 571-2550, 24 hours a day for emergency disaster restoration services. When water damage occurs in your home or building, no matter the source, you need to act fast to keep the damage contained. Excess water can get into your home due to rain, natural floods, pipe bursts, leaks, and overflows and it spreads quickly through porous building materials. Affected flooring, woodwork, and drywall will become damaged and mold may also appear if the water is not removed. Rainbow International Restoration of South & West Suburbs provides water damage restoration services in Oak Lawn, IL to remove the excess water and restore damaged objects and materials. 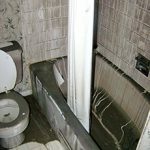 We use advanced water extraction equipment and proven structural drying techniques to reverse the effects of water damage. Standing water is already a major problem if it occurs in your home, but it is even more damaging and dangerous if the water contains sewage. Sewage commonly enters homes and buildings due to a sewage backup or natural flood water mixing with sewage before it enters the building. Water containing sewage is dangerous because it contains harmful toxins that cause infection and disease, and it can cause permanent damage to the affected materials. 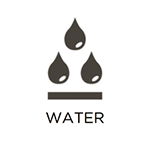 It is best to call a professional as soon as you notice sewage water on your property. Rainbow International Restoration of South & West Suburbs provides sewage cleanup services in Oak Lawn, IL to cleanup sewage backups and flooding containing sewage. We can effectively remove the contaminated water as well as thoroughly clean, disinfect, and restore the damaged areas. A fire in a home or commercial building can cause a catastrophic amount of damage that requires a fast response and complex restoration. As soon as the fire is out, you must call for fire damage restoration because the structural damage will only get worse and residual elements like smoke and soot will keep spreading and causing additional damage. 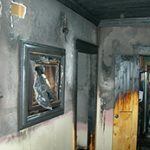 Rainbow International Restoration of South & West Suburbs provides complete fire damage restoration services in Oak Lawn, IL to restore and rebuild homes and businesses affected by fire. Our IICRC certified technicians will stabilize and repair your property and reverse the effects of soot and smoke damage using advanced cleaning products and procedures. 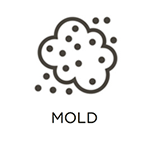 Mold is a major nuisance if it appears in your home or building because it can result in widespread property damage and serious health effects if left unchecked. 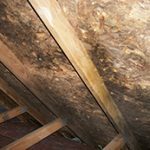 Mold growth almost always begins due to excess moisture in the home and it feeds on building materials like wood and drywall, leading to structural damage. The longer mold is in your building, the worse the damage will get and the higher the risk for negative health effects. At Rainbow International Restoration of South & West Suburbs, we provide complete mold remediation services to remove mold growth from homes and businesses in Oak Lawn, IL. We will contain and remove the mold growth and provide air quality testing to ensure that the mold removal process was effective. When a flood, fire, smoke, or mold affects your property, there is a good chance that many of your personal belongings have also sustained damage. Anything from clothing, books, photos, and documents to electronics and furniture may be damaged in such a disaster. Without quick restoration, these items may become damaged permanently. Our technicians at Rainbow International Restoration of South & West Suburbs can clean and restore your damaged personal items with our content cleaning and pack-out services. We can safely pack-out damaged belongings in Oak Lawn, IL and take them to our secured facility where they will be fully cleaned and restored, stored in our climate-controlled facility, and delivered back to you when the restoration is complete. While fires can and do cause plenty of property damage, it is common for the smoke and soot to cause even more widespread damage than the flames themselves. This is because soot and smoke will continue to linger and settle after the initial fire has been put out. The smoke, soot, and other corrosive byproducts of a fire cause tarnishing and etching on affected surfaces and objects and this type of damage will quickly become permanent without proper cleaning. 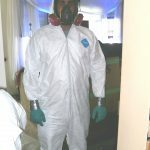 Rainbow International Restoration of South & West Suburbs uses advanced cleaning products and techniques to provide effective soot and smoke removal services in Oak Lawn, IL. Our technicians will fully clean and restore your soot and smoke damaged items to prevent them from becoming permanently damaged. 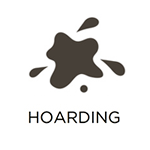 Hoarding may seem like it is caused by laziness or apathy, but it is actually a mental disorder. Those affected suffer from anxiety and depression that make it difficult for the individual remove anything from their home. This results in extreme clutter buildup that can increase the risk of injuries, fires, and unsanitary conditions from mold growth or pest infestations. 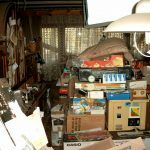 You should not start to clean the home of a hoarder until you have approached them about the situation and they agree to proceed with the cleaning. At Rainbow International Restoration of South & West Suburbs, we provide complete hoarding cleaning services in Oak Lawn, IL to clean and disinfect the homes of hoarders. Our technicians will take a respectful approach to the situation and work with the affected individual throughout the entire restoration process. The idea of an accident or violent crime happening on your property can be overwhelming, but it is important to know how to react to such a traumatic scenario. The scene of a major injury or death will likely contain biohazard materials like blood and bodily fluids that consist of toxins that spread disease and infection. It is important to call emergency responders right away, but you must also call a licensed professional to restore the scene. 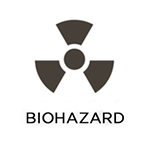 Rainbow International of South & West Suburbs provides biohazard and trauma scene cleaning services in Oak Lawn, IL and throughout Cook County to clean, disinfect, and restore property affected biohazard materials. Our technicians take a sensitive and respectful approach to these projects and work discreetly to restore your property as quickly as possible. The destructive nature of fire is well known, but many people do not understand how damaging the byproducts created by a fire can be. 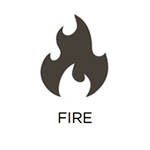 The heat from the fire creates a chemical reaction with the materials within a home or building that forms the corrosive byproducts soot, smoke, and residue. These byproducts are still present after a fire is put out and they will spread and cause damage to the materials they contact. Odors from the smoke and fire may also be lingering in the aftermath. Rainbow International Restoration of South & West Suburbs provides smoke and odor removal services to help homes and businesses in Oak Lawn, IL affected by smoke and soot. 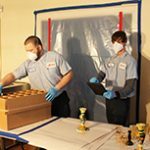 We can help avoid permanent damage by effectively restoring objects and materials affected by soot and we use advanced deodorization techniques to eliminate odors. For any of the restoration or cleaning services listed above, please call Rainbow International Restoration of South & West Suburbs at (708) 571-2550 if you live or work in the Oak Lawn, IL area.